Custom Leather Car Seats - Why Choose Them? Custom Leather Car Seats – Why Choose Them?. Custom Leather Car Seats | Why Choose Them? There are many reasons why a car or truck owner would choose to install custom leather car seats. We are all individuals and each of us has a different combination of reasons for installing this transforming upgrade. I have listed below four major reasons for choosing custom leather seats and I explain the logic behind each reason. Leather Car Seats Make Our Cars Stand Out In A Sea Of Sameness. As individuals, we all want to express ourselves in a world where, to many businesses and even our employers, we are just numbers. When you install custom leather car seats you set your car and yourself apart. And you give yourself a range of options to express yourself. For example, you can choose from a wide variety of colors and designs. They can either blend in with your car’s existing interior or exterior; or, if you are bold, you can choose a color combination that makes your car eye catching and draws comments. Many people think car seat covers and custom car seats are the same. Nothing could be further from reality. 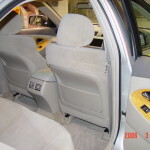 As the name suggests, the custom leather car seats are made for your make and model of car. 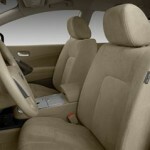 In addition, the leather replaces the original fabric on the seats and become an integral part of your car. It’s just as if you had opted for leather seats when you bought your new car from the dealer. On the other hand, seat covers are just what their name suggests; a loosely fitting design which you drape over your existing fabric seats and tighten with a draw string to keep them in place. They never fit perfectly and often change position as you and your passengers enter and exit your car. They never give that crisp factory-look that you get from the real thing. When you are in your car you want to enjoy the experience. Beautiful, soft leather pampers you. The rich smell of leather reminds you of the luxury and elegance you are enjoying. In addition, your driving experience is enhanced by the comfort and the scent of leather. Eating food in your car is unavoidable in our busy lives. No matter how careful we are; accidents happen. If you have children the risk of a ketchup or coke spill is even greater. With fabric seats the probability of a permanent stain from those spills is very high. I’m not saying that you can leave spills on your leather seats with zero bad effects. But if you wipe the spills with a damp cloth when they occur, chances are high that you won’t have any staining. Are There Other Reasons To Install Custom Leather Car Seats? I’m sure you can think of other reasons to buy and install custom leather seats. However, these are four compelling reasons to do so. The real benefit is that, no matter which reason prompted you to install leather seats, the value of your car has increased with this addition. Isn’t it nice to know that you can give yourself the gift of uniqueness, comfort or low maintenance and increase the value of your car at the same time. If you are even considering this affordable luxury you owe it to yourself to visit our website and get the full story. You can do so by clicking here. Custom Leather Car SeatsCustom Leather Car Seats – Why Choose Them?